On this personal tour for eight adventurous food lovers, Yoko will take you on a journey to explore historical festivals, community events and locally acclaimed restaurants. She created the tour to share the best parts of rural Japan during its best season. Most importantly, you will know what every one of her friends knows: Wherever Yoko goes, tasty morsels will follow! Winter in Toyama Bay is known for producing an abundance and variety of wild fish. It’s a season truly made for seafood lovers: Fresh crab meat sashimi, fatty yellowtail, and Kobako-crab just to name a few. On this five-day tour, you will discover the sublime pleasures - food, architecture, craftsmanship, and history - for which this region is rightly famous. As part of the "Seafood Feast Tour" our featured meals include: Wajima morning market's grilled fish breakfast, well-known Himi Seaport's best seafood supper at a Japanese inn, a local Italian restaurant, a farm-to-table French restaurant, and the breath-taking Kaga Kaiseki cuisine. We will explore the rich regional history of craftsmanship: Wajima lacquer and gold leaf in Ishikawa. Glassware and Suzu tin work in Toyama. Discover beautiful tableware and sake serving sets that make great souvenirs that you can buy for yourself or as a special gift. Noto Peninsula is known for its cold winters and the sake production group called "Noto Toji". They are considered one of the best sake brewers in Japan and employ seasonal workers who migrate to work at the sake brewery. Yoko will explain more about this old traditional system while you enjoy the local sake. Visits to modern architecture works on the tour include the Toyama glass museum and library by Kengo Kuma and The 21st Century Museum by Kazuyo Sejima. The historical architecture we will learn about include: The national treasure Zuiryuji-Temple from Edo period to the Michelin one star awarded Nomura residence and its beautiful garden. We will meet at JR Toyama station at 10 am. From there, Yoko will guide you to a farm-to-table French restaurant for lunch followed by a trip to the glass museum, shops, and observatory in the city of Toyama. We will end the day at the local's favorite bar town. We will start with a morning walk at Zuiryuji-Temple and then enjoy Toyama's Kito Koto Sushi lunch. ("Kito kito" is how locals describe the very fresh seafood in Toyama). Afterwards we'll take a local train that runs along the Toyama Bay overlooking the famous Tateyama mountains across the ocean. We'll get off at the final station, Himi, the famous seaport town where we will stroll among the local fish markets and hot springs before treating ourselves to a seafood feast dinner. Kanazawa has been the capital of art and culture in this region for the last 400 years. As the pride of Kanazawans, the city upholds the highest standard of fashion, art (including the culinary arts) and architecture, which attracts Japanese tourists as well as tourists from abroad. The old town and the modern buildings are located in the central city and are all within walking distance of each other. This means our day will be filled with vigorous walks. When we get tired, we will have no trouble finding a tea house or cafe. We will end the day with Kaga Kaiseki cuisine which will absolutely be the highlight meal of this tour. 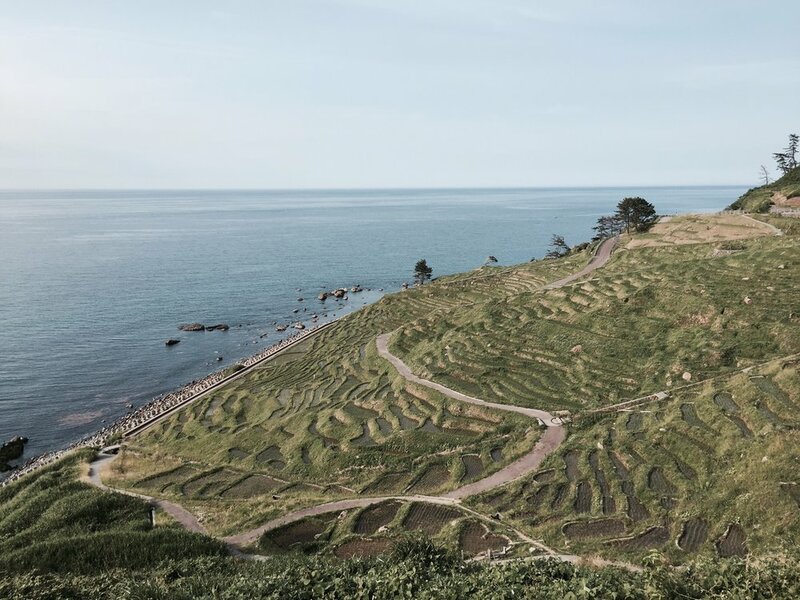 Wajima is located at the Northern tip of Noto Peninsula: It’s well-known for its morning market, beautiful scenery along the sea coast, and beautiful hand-made lacquer that locals have been using from generation to generation through regular repainting. We’ll get to experience using the wajima-lacquer tablewares firsthand when we dine. We'll stroll along one of the three most well-known morning markets in Japan: Wajima Asaichi, where you can buy both fresh and dried seafood and have it grilled over charcoal onsite. It’ll be one of the most memorable meals you'll have on this tour. There are also some lovely Wajima lacquer stores on this street. Shop and dine to your heart’s content until we head back to Kanazawa. Additional Notes: We'll be walking 3 to 5 miles every day. Please wear comfortable shoes.